Insane in the membrane, INSANE IN THE BRAIN! WOW! That word pretty much sums up my weekend! What a way to end the winter climbing season! 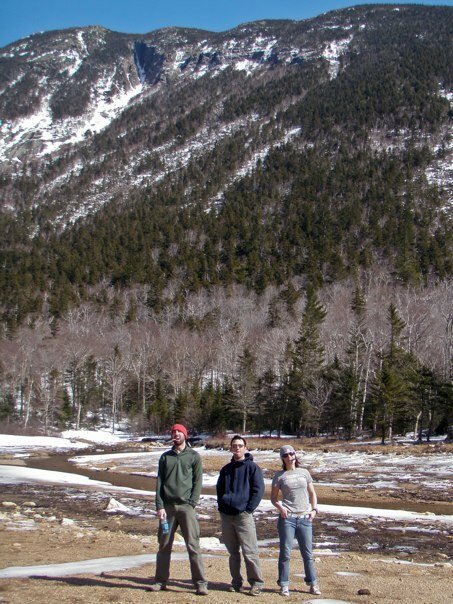 Mark, Mike and I began our hike up one of the gullies on Mt. Webster fairly early on Saturday morning. We had the most perfect weather you can imagine. We all actually got a little bit of a sunburn on our faces. 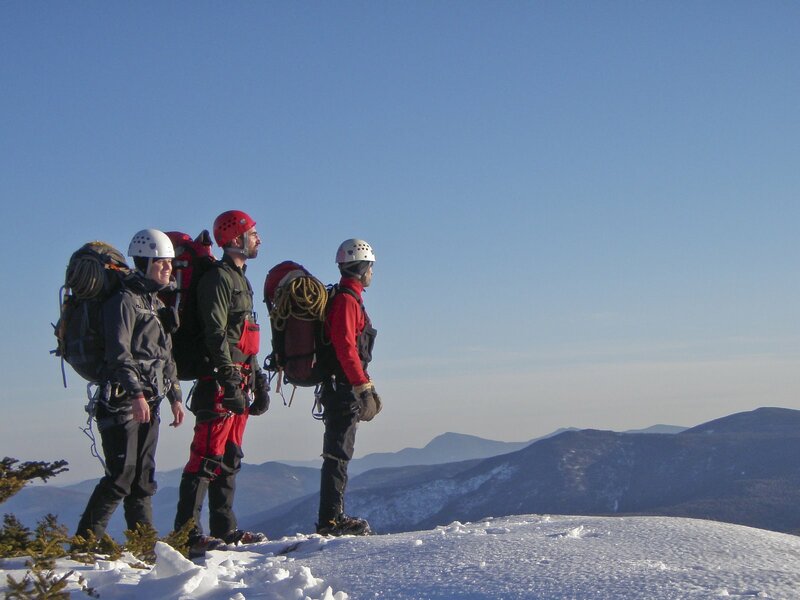 Most of our time was spent hiking some 1500 ft on a snow-covered gully, which turned into some ice at the top, then we had to bushwhack through some very dense trees for a 100 ft. or so until we finally reached the top where we spent the night on the ridge. We found a cozy spot amidst some trees where we dug out a tent site and set up shop. It was a lovely night (not too cold) and we awoke to yet another beautiful sunny day today. A mere 3.4 mile hike through some portions of knee-deep snow and the occasional opportunity to glissade got us to the road where we had to walk another mile or so to the lot where we had parked to the car. My feet were really excited to see the car! Ha! 🙂 It was definitely one of the best weekends I’ve had this winter! Mark and I making our way up the gully. Moving on… the weekend leading up to this past weekend, Danielle and I headed up to Loon where I finally, FINALLY, got to use my skis! It was so AWESOME to be back on skis! It was a beautiful day and the snow was just right. Danielle and I experienced some great “spring skiing”! Going backwards even still… the weekend before that, Mike and I headed north to get some more ice climbing in. Despite the crowds, we managed to get a couple climbs in at Kinsman. We spent the night in North Conway and got up early to attempt Black Pudding Gully. We hiked all the way up to the base of the climb, Mike started up the climb and with the first swing of the ice axe into the vertical section, out rang a loud hollow sound (not good when ice climbing). Mike did some investigating and discover that he could do the Irish Jig in the large, 10 foot tall section that was between the ice and the rock. In my opinion, Mike did the smart thing and backed off the climb. We decided to venture further up the road to a place we hadn’t been yet, Texaco. We were able to get a couple climbs in there and then headed home. So, with Spring just around the bend… I guess you could say I’ve had one, totally rad winter!! The picture of Mark, Mike and I above was taken from atop Mt. Webster. For pics of Mt. Webster, click here. For pics of Kinsman, Black Pudding and Texaco, click here. 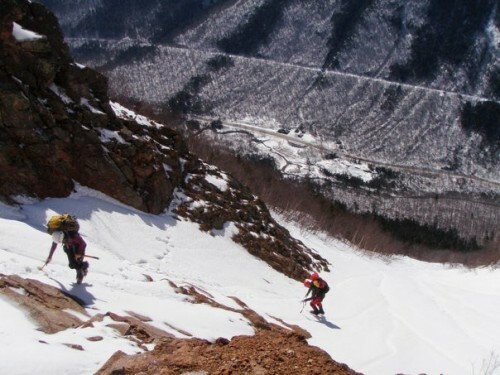 This entry was posted in Adventures and tagged adventure, backpacking, climbing, hiking, ice climbing, Mt. Webster, New Hampshire.